It’s happened! My baby has started to pull to stand and moving. Everything just seems to be happening so fast! I can’t just cuddle and hold a cute little baby anymore, he wants to move around! This means that I need to start thinking about shoes. With all the different options out there it’s important to know what is best for baby as they are learning to stand, cruise, and begin walking! 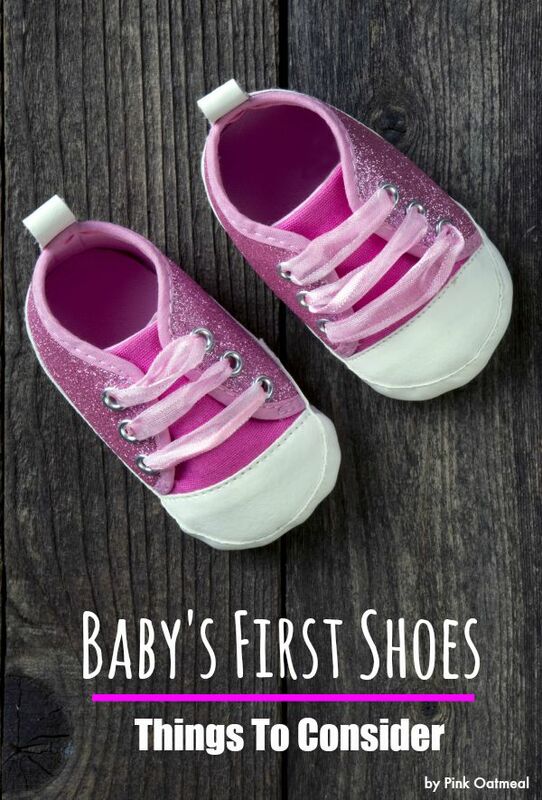 Here are some things that are important to know for baby’s first shoes! As adults we are always looking for that shoe that gives us the appropriate support. Then there is the arch. How many people do you know that have orthotics or arch supports? Research shows that a baby doesn’t even start to develop an arch until they are approximately 1 year of age when the baby learns to stand upright. The truth is that childrens feet are even fully developed until they are approximately 5 years old. That means that it is perfectly normal to see your baby with flat feet. A baby has a fat pad where the arch of their foot is which makes them look flat-footed! This is perfectly normal. The fat pad becomes absorbed between the ages of 2 to 5 years. Now knowing this we know that we don’t need to worry about having arch supports in the shoes but what should we be looking for? Consider that your baby is just learning the new skill of standing, walking, and balancing. Your baby needs all the input that they can get from the ground to let them know where they are in space. The way I always tell people to think of it is imagine they are suppose to walk on a balance beam. Would you prefer to walk in your sneakers or would you want to walk barefoot? I’m guessing your answer is barefoot. Barefoot walking gives that feedback to let one know where they are in space when one’s balance is challenged. What does that mean for baby then? Looking for a shoe that is as close to barefoot is what is actually best to help them develop their balance, standing, and walking. Research has shown that, “ slimmer and more flexible children’s shoes do not change foot motion as much as conventional shoes.” They note that this should be recommended for healthy children in general. or sock footed at least so they can continue to get that much needed input baby needs to know help them continue to develop their motor skills! So personally, I’m probably a little too excited for shoes when my little guy should really mostly be barefoot. For those times when I’ve felt the need for something on his feet I’ve personally been using two different kinds of shoes I’ve picked up a pair of Mini Stars at Target and a pair of Robeez. Both I’ve been very happy with. They are very flexible and are as close to barefoot without actually being barefoot. On top of that they are cute and have great options! Since we are talking about baby’s firsts be sure to stop by and visit some other great input on baby’s firsts! Be sure to check out more about baby’s firsts! Hi. I am an infant preschool teacher. I understand how important it is for infants pulling up, cruising, and beginning to walking to be barefoot. But I do have a problem with soft shoes such as Robeez. They aren’t snug around the foot, therefore when baby is trying to feel the ground and gain his balance his foot is slipping in the shoe. Parents seem to think I am over reacting when I explain this to them. I actually prefer a more stable shoe with a flexible sole for outside play. I feel it gives the baby a solid platform in which to stand and his foot doesn’t slip inside the shoe. But barefoot is always preferred in my classroom (and playground, weather permitting). Thank you for your comment! I’m still a fan of Robeez for my son and those who are learning to walk (walking is not their primary mode of transportation) if any shoe is necessary just due to the fact that they are as close to a “foot cover” that I have found. I will note, once walking becomes more their main mode (toddling around) I like the next option up at Robeez (Mini Shoez) that provides a little more support at the bottom for outside play so that no rocks, sticks etc can bother the bottom of their feet but still provide them with feedback that they need. Like you said barefoot is always preferred and thank you for always being so aware to do that in your classroom! I just bought each of those brands of shoes at Target this weekend for my son! I’m impressed so far. 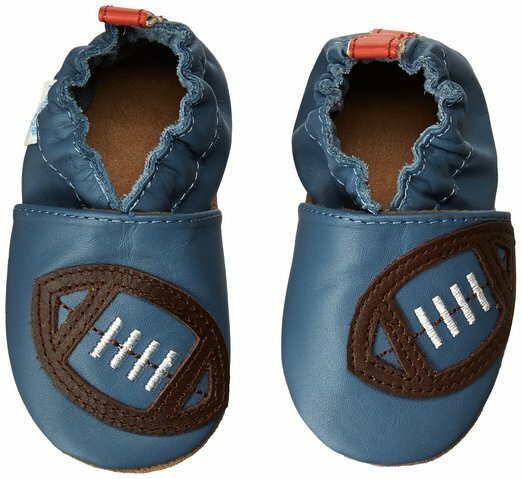 What shoes would you recommend for a child age 2+? We live in Michigan, so we need something appropriate for wear on wet or snowy ground in the winter. We loved mini star and have been through two pair of stride rites as well. Thank you! Hi there! I still like shoes that have very flexible soles but yet can withstand the elements. Robeez has a shoe that is a mini shoe. That shoe still has flexibility in the sole but more coverage to protect against rocks, sharp objects etc. The important thing is that when you are shoe shopping is make sure that the shoe has a flexible sole. So if you pick it up you can bend it. In the toddler years you still don’t want a shoe that has too “supportive” of a sole. I hope that helps!